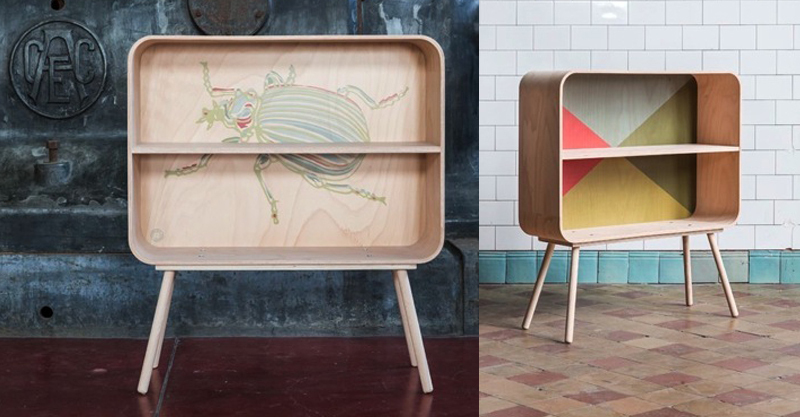 We love finding a new designer who specialises in creating beautiful furniture pieces just for kids, and Eva Craenhals has got the goods. This Belgian creative is the brains behind design house, Savo & Pomelina, and her latest collection is simply divine. Starting with humble beech wood, Eva Craenhals employs traditional methods to fold the wood into desks and shelves with clean lines and rounded corners. It is the second dimension of colour and illustration that really sets the Tonton Collection apart though. The Television Scarabee adopts the comforting shape of a retro television set to house a gorgeous shelf. The light finish of the wood makes it a great canvas for special treasures while the enchanting graphic of a scarab beetle on the back wall offers a twist that is intriguing and connects it back with nature. The coloured shapes in the Television Diamond gives the same lovely shape a design with wider appeal. The pieces in the television series are priced at €620. I just love the Tonton desk and chair series. Available in three different colour and graphic styles, this desk and chair offers a stunning aesthetic that works with industrial, modern or traditional decor and styling. 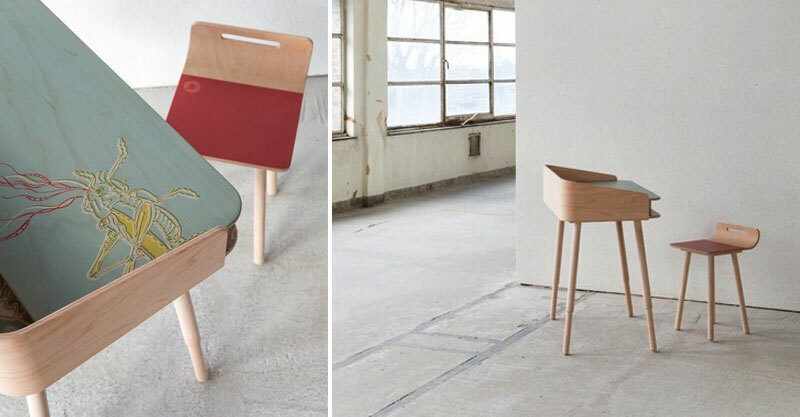 The desk costs €620 and is 73cm high while the stool is priced at €150 and sits 44cm off the ground, making it perfect for those early years of creating and learning. All Savo & Pomelina pieces have been crafted in Europe from materials that are sourced and produced fairly and naturally. These pieces and the rest of Eva Craenhals’ designs can be found on the Savo & Pomelina website. For more information about the collection, including details about pricing and shipping, please contact designer, Eva Craenhals.